Crystal clear waters, fish that are all colours of the rainbow, anemones, turtles, corals: coral reefs are some of the most complex and beautiful ecosystems on this planet. They are a hazard to passing vessels, but are havens of biodiversity and can help protect coastlines. Coral reefs are build by tiny invertebrate animals belonging to the same family as jellyfish, Cnidarians. They grow in colonies, forming huge reefs that can stretch for miles. 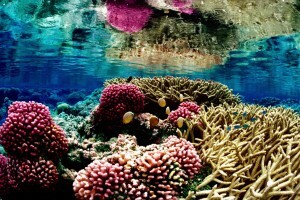 These vast cities of coral play host to many kinds of undersea creatures. At the moment, we’re witnessing unprecedented coral “bleaching events,” which are proving disastrous for biodiversity. How do corals grow? How do they protect shorelines? Why do coral reefs matter so much? This week we’ll be exploring coral reefs and marine ecologies with four fantastic marine biologists. We’ll learn all about coral, the ecosystems of reefs, but also about sea grasses and estuaries, rock platforms and other structures on coastlines. Assistance Professor Jessica Carilli, School for the Environment, University of Massachusetts, Boston will talk about the basic biology of corals, how they form those amazing structures, coral bleaching and of all things, coral fat stores. Marjorie Linares, PhD student, University of Sydney will talk about anemones, algae and corals. Amanda Clarke, PhD student, University of Newcastle, Newcastle, Australia will talk about sea grasses, estuaries and how they are coral nurseries and the importance of mangroves. Dr Carly Kenkel, postdoctoral scholar at the Australian Institute of Marine Science, Townsville, Australia, will talk about coral adaptation, reproduction and assisted evolution. Stay tuned – it’s going to be a big week!